From the beloved author of Scot On The Rocks and Jack With A Twist comes a new novel about just what it means to follow the music of your own heart. I have to admit, I didn't read the synopsis before getting into this one out of fear that it would spoil the book for me. I read it after finishing the story and I realize it was good I steered away because it does give away some factors of the plot. 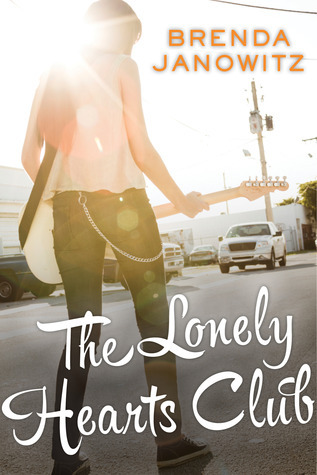 Anyhoo, from the cover, I deemed The Lonely Hearts Club to be about a girl trying to make it in music, more specifically as an indie rocker who refuses to conform or sellout. I wasn't far off, but there were certainly a lot more offered in the story that wasn't expected. And I liked that I was surprised. From the opening line, I was hooked. How horrible it was to not only get fired from your job, but to be fired by your own father at that. My gosh. It was sad, if not embarrassing somewhat. And in a way funny because admittedly, I laughed when it happened. Then I saw his intentions and what he'd hoped would happen as a result of his decision to take her privileges away because in fact, she wasn't making any moves or going after her dream. Jo was just stagnant, too comfortable. I liked how she had a wake up call, even though it took her jerk-of-a-boyfriend leaving her, as well as her father giving her an ultimatum. In regards to her character, Jo turned out to not only be witty, but she was also funny and carefree, and as realistic as a girl in her early twenties could be. I liked how the story was delivered, and how imperfect she was. She wasn't this sweet, polished girl living in an unbelievable world. Jo was still trying to figure stuff out and it goes to show that even when you become an adult you don't always know the next step to take in your life. Her perception about certain things was understandable and I felt like I could relate with her in a lot of ways. I'm actually glad it wasn't based on her getting a musical break right away, and that there were these other aspects that helped to motivate her in picking up music again after the sad ending to her band which caused the break in her dream chasing. It was cool how people came together over something she said and made an emotional connection to it, even though, like her father, it was negative energy at first. But it was great how in the end a lot of people found happy ending and didn't give up on love. It always worked for Jo because she found something special with the quirky and tech savvy Max, and it also motivated her to go after music again. There are so many other things I could mention that added up to The Lonely Hearts Club being an interesting and relatable reading experience but then I don't want to spoil it for you. All I can say is Brenda did a good job in writing such a good story and fans of coming of age novels will surely be delighted by this one. Sounds good, I love the title, that alone makes me want to read it!